text from Skanda-Murukan cult in Eastern Sri Lanka: Continuity and Change by N. Shanmugalingam. The Mantūr Murukan temple is situated along the Batticaloa lagoon, about 20 miles south of the Batticaloa town. The temple is popularly known as Tillai Mantūr or Cinna Katirkāmam ('Little Katirkāmam'). The temple is shrouded in myths; most of these centre around the Veddas, some of which are described below. God Skanda after successfully defeating the asuras was returning East, when he encountered the Vākūra Hills. The God in his anger split the hill into two with his V�l. Three bright rays emanated from this, each one of the range traveled in different directions. One of these reached Mantūr and sheltered within the tillai trees, which came to be patronized by the Veddas. Another myth relates to the might of God Skanda-Murukan. A detachment of Portuguese soldiers after the conquest of the East advanced toward the temple to loot it, but they were attacked by wasps. The frightened soldiers fled for their lives, leaving behind their weapons, including muskets and swords. The latter are still kept in the sanctum sanctorum as reminders of the might of the God residing at Mantūr. A permanent temple was put up in 1215-1248 by King Nāka. The structure of the temple is a replica of that in Katirkāmam. In the outer courtyard there are two lesser temples. One of these is for Teyvayānai Amman and the other for Valli Amman. In the inner courtyard there are two shrine rooms: one for Pillaiyār and the other for Nākatampiran.  There is a worshipping platform for Kumāra Tampiran. In addition there are nine stone pitās, one representing Valli's brother and the other eight the Attatikku Pālakar, meaning those in charge of the protecting the eight directions. Patterns of Worship at Mantūr are ancient and virtually identical to those in Katirkāmam. 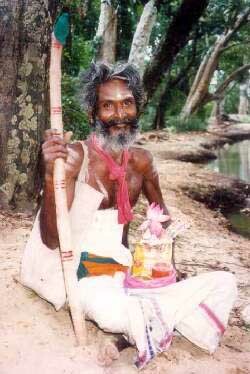 The officiating priest is called Kappukanār, equivalent of Kappurāla of Katirkāmam. The priest is chosen from the C�rpata kulam (clan). 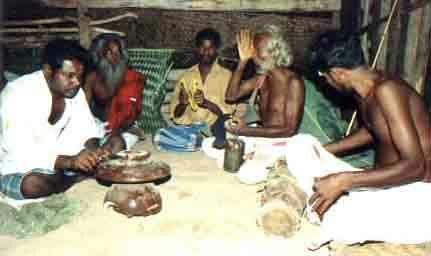 The Veddas are also given equal importance; for instance, the ārāti Pen or woman performing the lamp rituals is chosen from the Vedda group. 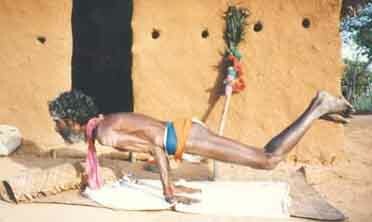 Above: Mandur Yogaswami demonstrates his mastery of the difficult mayurāsana pose. The annual temple festival of 20 days starts with the hoisting of the flag (kotiy�rrum) and ends with the water cutting ceremony or t�rttam, which falls on a full moon day in the month of August. A sacred box, reputed to contain the deity is taken in procession in a covered vākanam. On its way it is brought to the Valli shrine for a while before returning to the main temple. On the last day, following the water cutting ceremony, Murukan rests in Valli's shrine for the rest of the day. During the procession, Arāti Penkal and the Vedda representatives (pretend to) faint, and they recover only after being carried to the Valli shrine before the lowering of the flag on the last day when the Vannimai (Vannakkar) is informed by the chief priest that the festival has been conducted successfully. With the lowering of the flag, the festival is declared over. The day ends with the management taken in procession to a feast prepared by the Vannakkar, Vellālar, Kannakka Pillai and the T�sa Vannimai (authorities of the surrounding villages). The ritual importance and prestige given to the administrators like Vannakar and others tends to reinforce the continuity of the administrative structure. In addition the present day socio-political problems have helped to maintain this administrative structure. To a question concerning changes in administration or temple structure, one of the local authorities said, "We should preserve our traditions not only for our prestige, but also for our regional identity." On the third day after the water cutting ceremony, the Veddas celebrate by cooking what is called a p�raviyal consisting of milk rice, sweetmeats and venison and offer the same to Kumāra Tampiran in earthen pots. At the end of the fasting, devotees cook milk rice and offer it to the kannikai (virgin bride). Kanta Casti is another important festival celebrated for six days in the month of October-November. On the last day, the divine marriage of Murukan to Teyvayānai is celebrated, with the devotees divided into two groups, one representing the bride's party and the other the bridegroom's party, and exchange cirvarisai, just as in a village wedding. At the end of the fasting, devotees cook milk rice and offer it to the kannikai (virgin bride). Mandur devotees have long felt the need to define a sacred space of their own where they can meet occasionally to exchange news, songs and stories about their Lord Murugan. Since Mandur is also an important destination for other devotees including the Kataragama Pada Yatra pilgrims, Mandur devotees wished to have a place to prepare and offer annadānam as well. Thus even in the midst of Sri Lanka's ongoing ethnic conflict, the Mandur Yoga Ashram has grown and survived. Devotees however have mourned the untimely demise of the foremost stalwart Murugan bhaktar among them, the gentle Mandur Yogaswami who passed away in 1995. 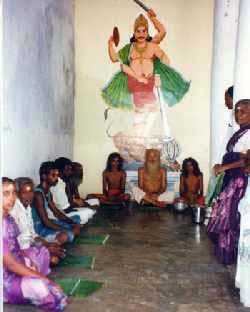 Despite this blow and the loss of other devotees who have moved from Mandur, Mandur devotees always welcome visitors from near and far and are always ready to provide accommodation in the Yogashram or in any of Mandur's numerous madams. For more information contact: Living Heritage Trust of Sri Lanka. "Skanda-Murukan cult in Eastern Sri Lanka: Continuity and Change" by N. Shanmugalingam.